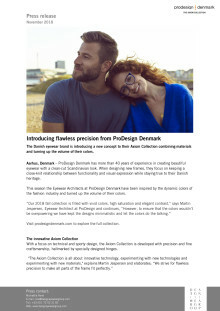 Aarhus, Denmark – ProDesign Denmark has more than 40 years of experience in creating beautiful eyewear with a clean-cut Scandinavian look. When designing new frames, they focus on keeping a close-knit relationship between functionality and visual expression while staying true to their Danish heritage. “This Axiom project is clearly all about flawless precision. The two materials are combined without using any screws or adhesion; it simply clicks together,” describes Martin Jespersen.